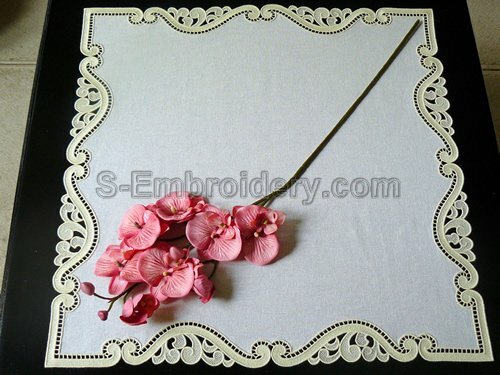 The set includes 3 free standing lace border embroideries - 2 straight parts and 1 corner. 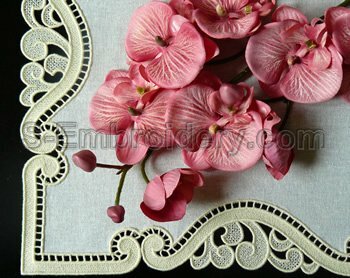 This free standing lace set can be used to create table topper, table cloth curtains with nice free standing lace embroidery decoration. By using different number of straight border parts you could adjust the size of your embroidery project. The square table topper featured on our web site has a size of approximately 22.4 x 22.4 inches (57 x 57 cm). You receive 3 machine embroidery files and 2 PDF files with design information and instructions.